City Council askaris have been annoying me for quite some time. They don’t mess with me but I picked a fight with one kanjo a few months back when he came down on an old cucu (grandmother) selling ginger and garlic on the corner of Ronald Ngala and Moi Avenue at night. I couldn’t stand the way he was starting to manhandle her and so I intervened. I shouted and stood in front of the hessian cloth display that she was trying to bundle up before he grabbed her goods and clobbered her head. He made me so mad I told him off. She could have been his own grandmother so he had to stop. I shouted until he finally got fed up and stopped. By that time, the cucu had fled. But I wasn’t so noble this past week. I wasn’t there to defend my friend Yvonne Adhiambo Owuor, the Caine Prize winning novelist who got cruelly attacked my plain clothed kanjos. Not that I could have actually stopped them but at least if I had been in Lavington, outside the Mall with her, I wouldn’t have let that guy grab her from behind and drag her away from me. The only reason Yvonne was standing on that street corner was because she’d gone shopping for Baobab oil in the Healthy U store. Her big mistake, according to one Kanjo woman was she didn’t run when she heard the ruckus, which is what most ordinary hawkers do. But Yvonne is no hawker and no ordinary woman. She’s the award winning Kenyan novelist of ‘Dust’, and one of Kenya and indeed Africa’s leading contemporary writers. She’s a woman of wide intellect and rich imagination who had to be curious when she heard noise coming from across the street from the Mall. But if being inquisitive can be a crime, then Yvonne was guilty. She made the mistake of asking the man near at hand what was happening? But rather than respond rationally, he took his chance to grab her and try to sweep her off her feet. Seeing him in plain clothes, she naturally thought this was daylight attempted robbery and she valiantly fought back. The guy was stronger than her however. It must have been traumatizing for our dear friend because a swoop of kanjos grabbed her phone, spraining her wrist and knocked her glasses off her sweet face. 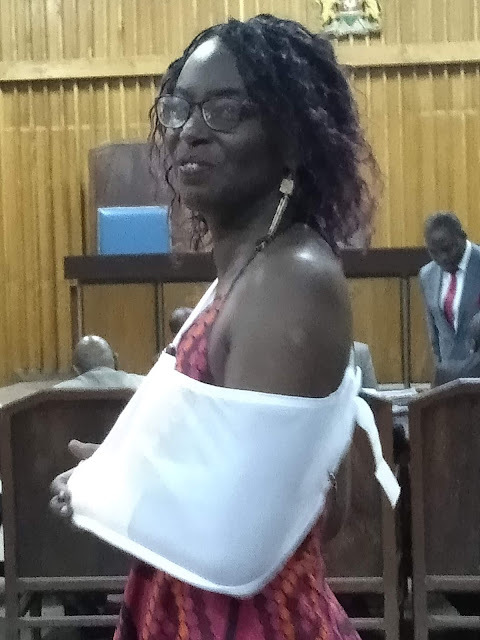 Our girl Yvonne was then thrown into a crusty old City Council van and carted off to jail. Booked on four crazy counts, she was charged with hawking fruits without a license and then dumping the produce (conveniently since they could never produce a single fruit). They also charged her with hurling abusive language at the kanjos (who she believed were thugs in any case) and she got charged with “resisting arrest” which we have to applaud her for! Fortunately, social media picked up Yvonne’s case relatively fast and we discovered she’d been thrown into the cells. 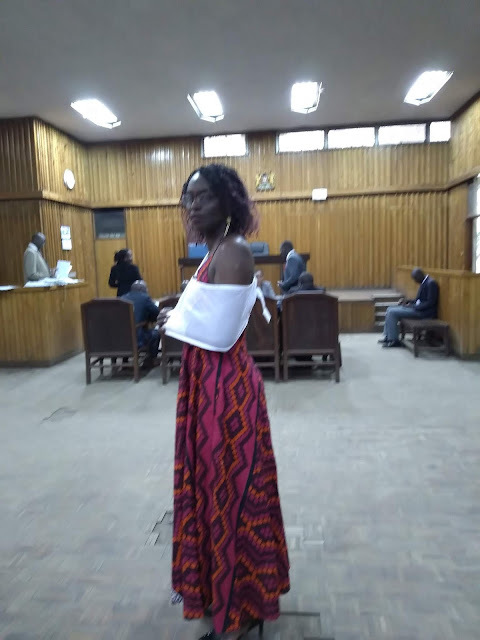 She stayed there for seven hours before she was able to make bail, paying the City Council KSh40,000. We want to see Yvonne get that money back along with her phone, her glasses and an apology from the City, the County and even the Governor. But we also had to show our solidarity with this brave woman whose only consolation thus far is that she’s been given exceptional new material for her next award winning novel. 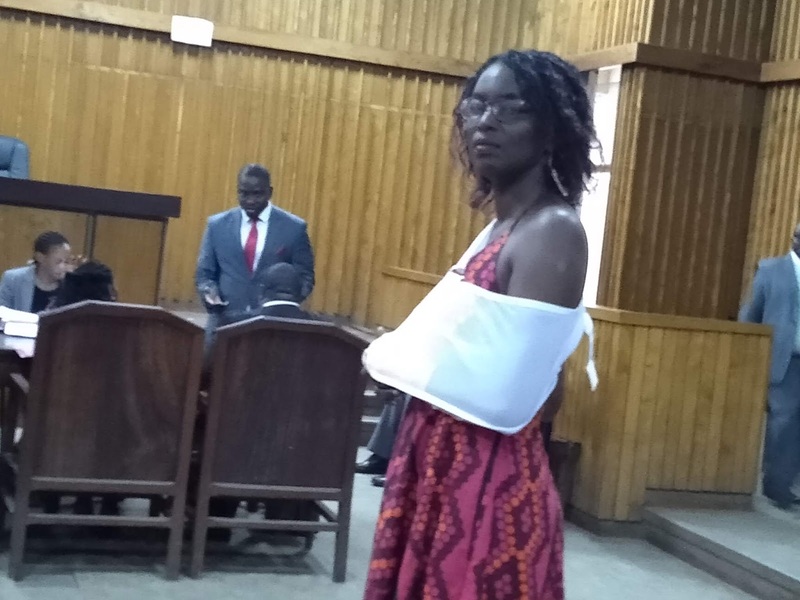 We went to court with her the Monday morning after she was grabbed (last Thursday, 2 August). It was gratifying to see how many brilliant Kenyans came to also stand with her in that hour when the court was meant to execute the rule of law. Her case was scheduled for 8am but of course, it wasn’t until 10:44am that we finally saw the Magistrate who said that since the Witness Reports hadn’t yet been sent to Yvonne’s lawyers, the case would be postponed until 4th September and would finally be heard 27th November. Until then, Yvonne is still technically considered a ‘criminal’. 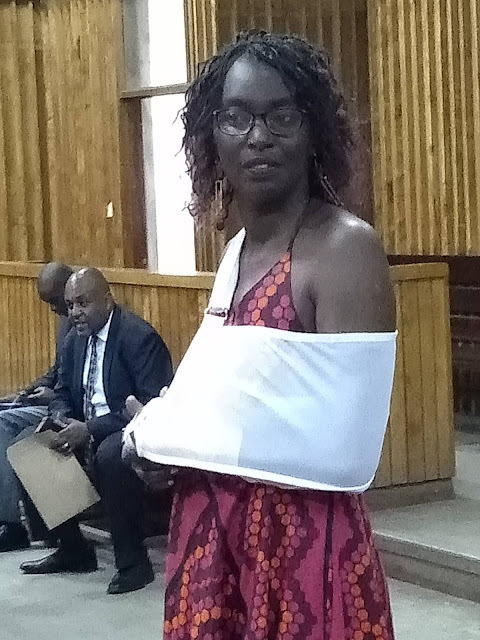 But to us she’s a heroine who deserves all the support from her fellow Kenyans, especially those who’ve been harassed by Kanjos and need to see them curtailed and taught to be servants of the people not slovenly scoundrels who use their petty powers to abuse innocents like our friend Yvonne.